The aeroseal sealant itself consists of a vinyl acetate polymer. Its ingredients are those commonly found in hairspray and chewing gum. In other words, yes, it is very safe. It’s nontoxic (As certified by the Occupational Safety and Health Administration) and it is UL approved. Will Aeroseal seal flex duct? Fiberglass lined ducts? Fiberboard ducts? Yes, yes and yes. In fact, we’ve yet to come across ductwork that Aeroseal will not effectively seal.That includes cement and brick passageways as well. Aeroseal can be used in homes with zoning systems, humidifiers, non-ozone generating UV lights and high efficiency air cleaners. Aeroseal pressurizes the duct to less than 0.1 WC – far less than the normal HVAC operating pressures. Only one to two ounces of sealant remains on the inside of the duct system. Will the ducts be covered with sealant? Aeroseal does not coat the ductwork. It remains suspended in air until it comes to a leak and is forced to the opening. Here it clings to the edge of the hole and then to other sealant particles until the leak is completely sealed. How much money will I save by having my ducts Aerosealed? This is probably the number one question asked by most anyone thinking of having their home or building aerosealed. As you can imagine, the answer varies depending upon a variety of factors. If, for instance, you live in Kansas City where the furnace is likely in use 2/3rds of the year, you will save more than someone who lives in a milder city like Portland, Oregon. Your utility rate, the severity of leakage, the design of the HVAC system and other factors all influence your energy costs and the actual amount you will save with Aeroseal. How quickly will it take for my customer to get a return on his/her aeroseal investment? This is really part two to the first question, and so the answer is very similar…it depends. Figures show that with all things considered, homeowners see an ROI on average in 2.5 to 5 years. My favorite anecdote to this question came from a homeowner who told me that when he showed his investment counselor the calculated energy savings he was expected to get from Aerosealing his home, he was told it was the best investment he could make. The broker said he couldn’t offer his client a single stock or investment option that would provide the type of return that he would be getting with Aeroseal. How long will Aeroseal last? Aeroseal has a ten-year warranty – but don’t confuse that with lifespan, which is much longer. Accelerated testing conducted at Lawrence Berkeley National Laboratory resulted in Aeroseal showing no sign of deterioration in the aeroseal seals – and it continued to seal much past the life span of tape and mastic. It has been durability tested to over 40 years. It exceeds all UL standard tests for durability. So the guarantee – the strongest warranty in the industry – covers the contractor for 10 years for parts and labor for any failure in Aeroseal seal but Aeroseal seal itself has proven to last for decades. Aeroseal was extensively researched, developed and tested in the most strenuous HVAC environments. Aeroseal provides a 10 year warranty on the seals. Note: the warranty is for on-site seal failures and does not cover additional damage (e.g. an electrician that steps on a duct while running wire), wear or tear (i.e. the shelf life of a plastic duct is passed, rodents eat into a duct, or a duct rusts out), and subsequent replacement of failed ducting. 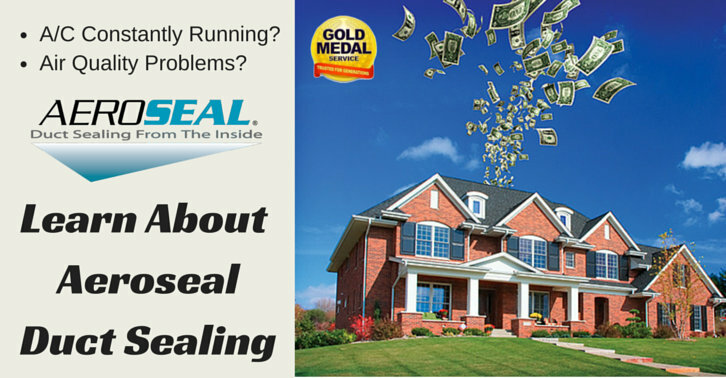 Does Aeroseal seal all leaks? Aeroseal seals leaks as large as 5/8’’. This encompasses the overwhelming majority of problem leaks in today’s homes and buildings. The U.S. Department of Energy states that “small holes” are the biggest cause of duct leakage. These holes are found primarily along the ductwork seams and around fittings. It is true that in some cases, portions of the ductwork become disconnected and Aeroseal, of course, cannot remedy this situation. But the Aeroseal process will alert the professional that this problem exists and allow him to address and fix this problem. Why use Aeroseal when I can do it by hand with tape and mastic. There are several reasons. First, it’s simply impossible to manually reach all the leaks in ductwork that has already been installed. The overwhelming majority of the duct is hidden or virtually impossible to access for manual sealing. If you want to have a real impact on energy savings and HVAC performance, you’ll need to reach and seal leaks throughout the entire duct system.